The Asahi Shimbun – Nov 8, 2016 – Experts were divided on the possible abdication of Emperor Akihito, with one side saying his wishes to step down should be accepted and the other calling for him to remain in the throne. The Nov. 7 hearing of the five experts before a government-appointed council was the first of three scheduled for November. The panel is headed by Takashi Imai, an honorary chairman of Keidanren (Japan Business Federation). The five experts on the imperial family institution and history spoke for about 30 minutes each in the closed session. Masayasu Hosaka, a nonfiction writer, and Isao Tokoro, professor emeritus of Japanese history of law and culture at Kyoto Sangyo University, indicated support for a special measures law that would only allow abdication by the current emperor. Their stance was based on the condition that the Imperial House Law would be later revised to allow for abdication by all subsequent emperors. “Because the emperor has made clear his feelings, it behooves those of us in the present generation to create a new Imperial House Law,” Hosaka told reporters after the hearing. He referred to the video message by Akihito broadcast to the nation in August in which he indicated a desire to step down and allow his eldest son to take over. During the hearing, Tokoro said that while the special measures law should be enacted as quickly as possible, the desirable alternative was to revise the Imperial House Law if at all possible. Sukehiro Hirakawa, a professor emeritus of history at the University of Tokyo, and Yasuo Ohara, professor emeritus of religion and administration at Kokugakuin University, opposed abdication. After the hearing, Hirakawa met with reporters and touched on the fact that Akihito outlined what he considered the emperor’s public duties during the August address. “It is not rational to allow the emperor to abdicate because he feels he cannot fulfill the duties that he himself defined,” Hirakawa said. Ohara said the current regent system should be used rather than allow for abdication. The fifth expert who spoke was Takahisa Furukawa, a history professor at Nihon University. 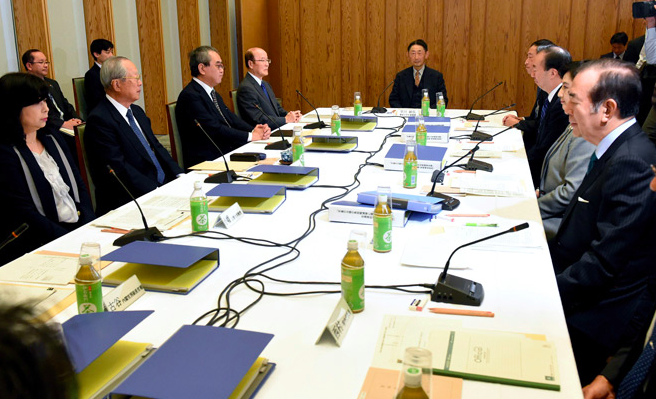 While taking a cautious approach to abdication, he also said that revising the Imperial House Law was the preferred course if abdication was to be allowed. Furukawa later told reporters that passing a special measures law to allow for abdication in response to what the emperor said in his address could be considered a violation of the Constitution, which prohibits the emperor from having political authority. Also on Nov. 7, Yasuhiko Nishimura, vice-grand steward of the Imperial Household Agency, held a news conference in which he stressed that it would be difficult to drastically reduce the number of official events that would require attendance by the emperor. Nishimura explained that one reason for the increased burden of official duties was that the number of member states in the United Nations has more than doubled since the Showa Era (1926-1989). That means sharply more audiences by the emperor with ambassadors who assume their posts in Tokyo, as well as with Japanese ambassadors before they go abroad. There has also been a large number of international conferences in Japan that the emperor has to attend, Nishimura explained.